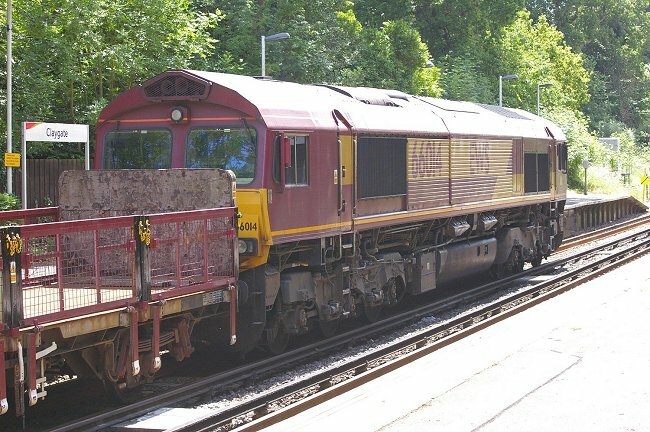 DB locomotive 66014 stands at the head of train 6N11 at Claygate station on 13th June 2009. 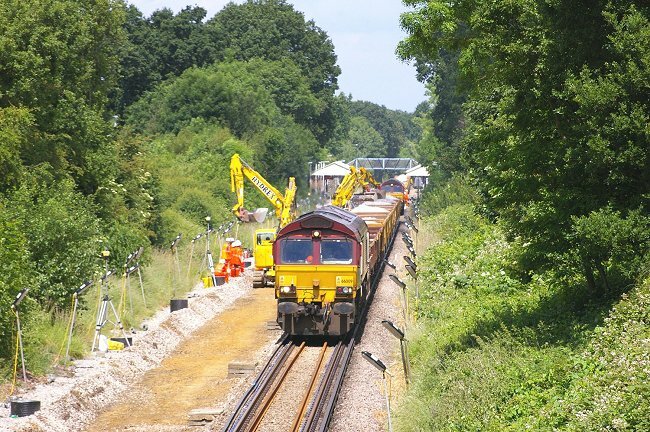 Another view of DB locomotive 66014 Claygate on 13th June 2009. OBA wagon 110154 in train 6N11 at Claygate on 13th June 2009. 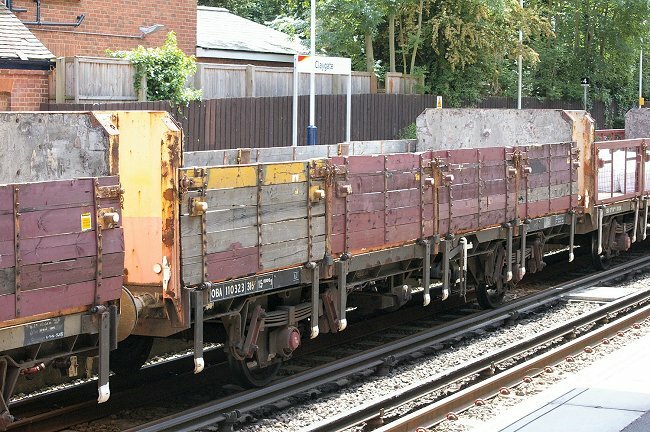 This is one of the type OBA wagons that had its original wooden drop sides replaced by mesh ones. 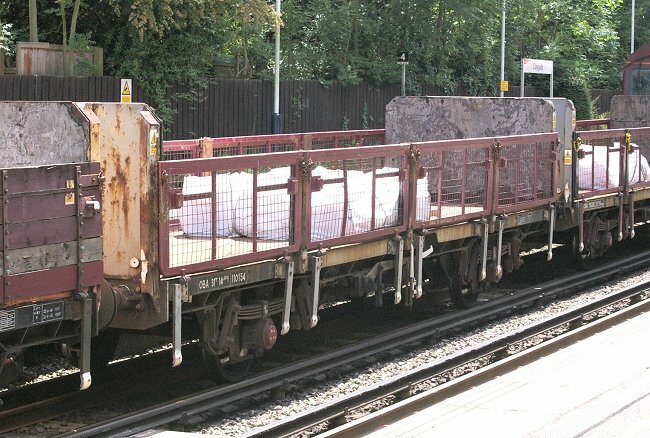 OBA wagon 110323 in train 6N11 at Claygate on 13th June 2009. 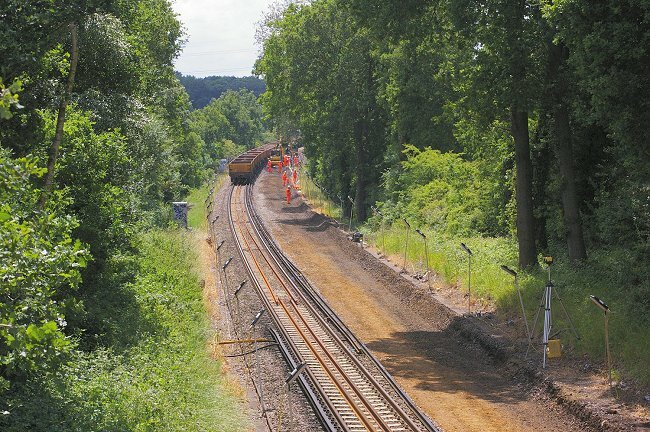 This is the scene a short distance from Claygate station. 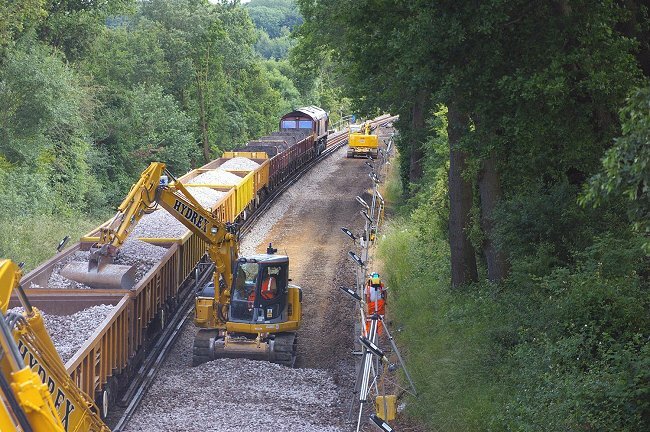 The track and old ballast have been removed in the foreground, but in the distance used ballast is still being loaded into the adjacent train. Locomotive 66009 stands at the head of train 6N10 while new ballast is being unloaded. Claygate station footbridge can be seen in the distance. 13th June 2009. 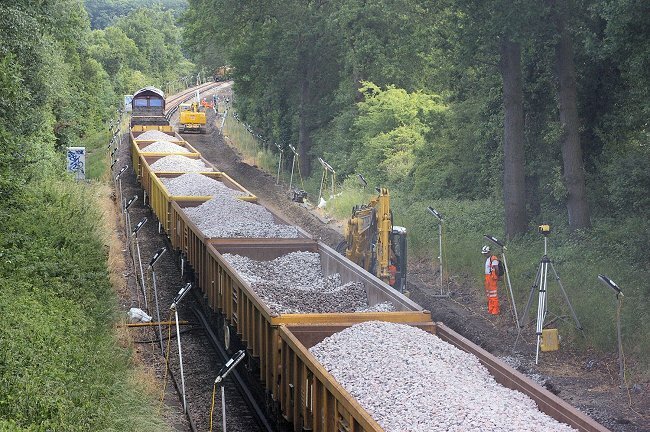 Another view of the ballast unloading operation outside of Claygate station on 13th June 2009. 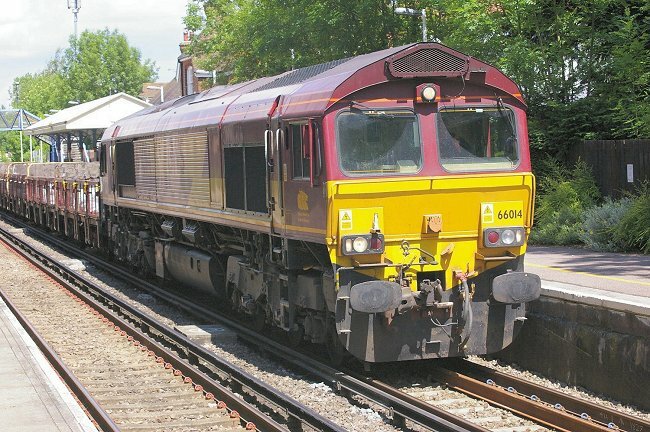 A The loading of old ballast into wagons south of Claygate station has been completed and 66009 has moved her train of fresh ballast forward for unloading. 13th June 2009. Locomotive 66149 has brought train 6N12 carrying fresh ballast into the work area. 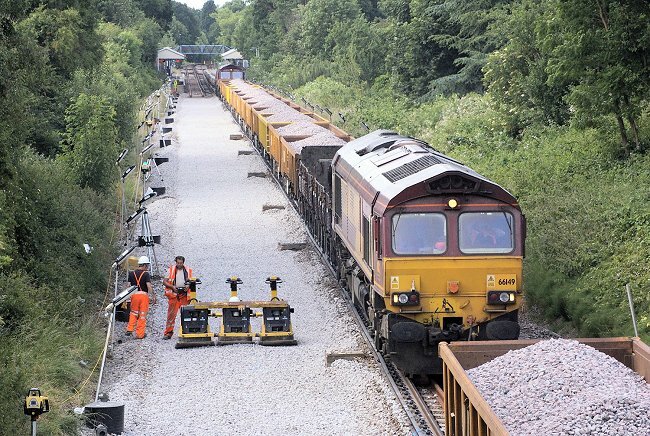 When unloading of the preceding train has been completed then 66149 will move forward for unloading. 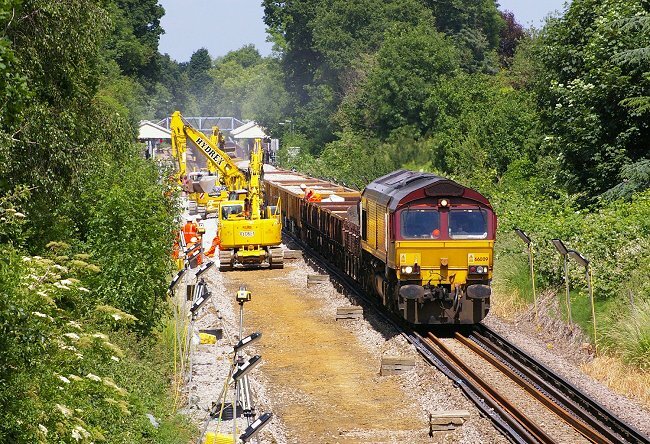 Beside the locomotive is a remote controlled triple remote set of tampers for compacting the track bed.. 13th June 2009. 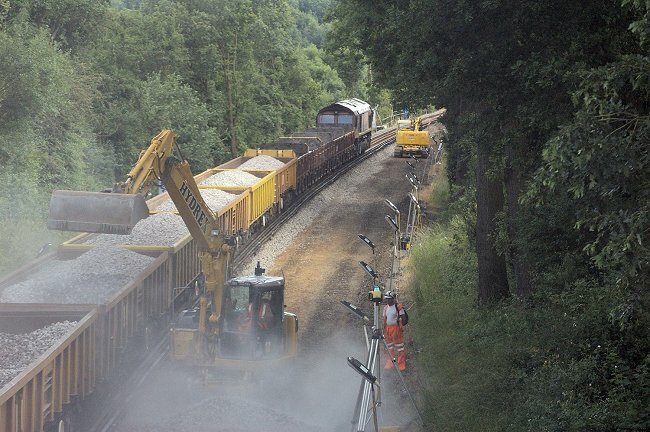 The unloading of fresh ballast from train 6N11 raises some dust. 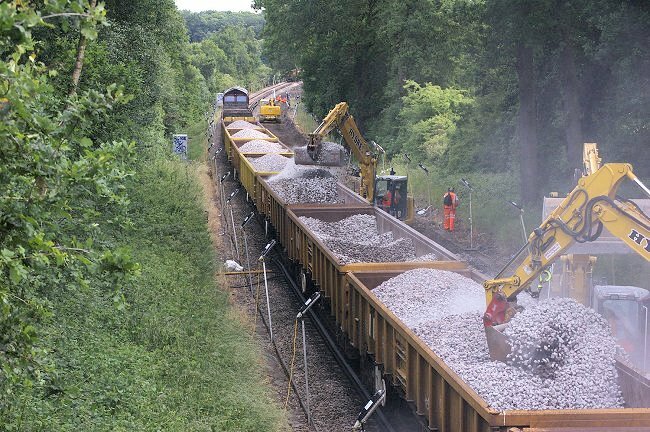 The unloading of ballast from train 6N11 continues. More dust is raised as train 6N11 is unloaded. 13th June 2009. 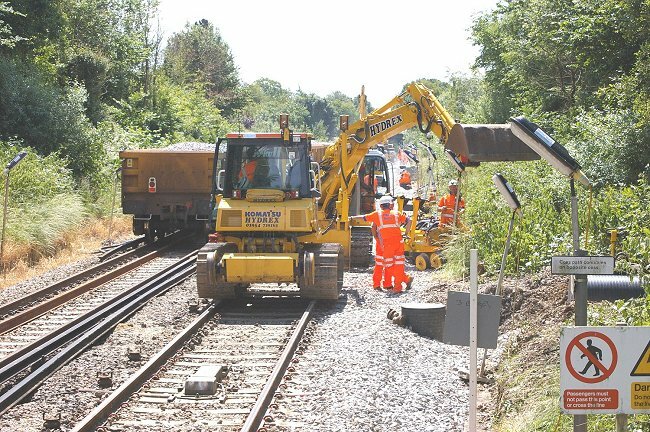 The engineering work area, as seen from Claygate station platform.